Back in 2004, Doug Pate and Marc Miller took their love for the surf and created Isle Surf & SUP. 10 years later, they own the #1 paddle board and surfboard retail store in San Diego, CA with their e-commerce site, Islesurfandsup.com We took a look at their e-commerce success in this case study. With a line of products that speaks to a focused market, Isle Surf & SUP wanted to get more qualified shoppers to their site. Like all online retailers, They wanted to capitalize on this increase in traffic by converting more visitors into leads and sales. With the recent emphasis on email marketing, the Isle marketing team knew that they had to increase email list growth. Isle Surfboards was able to drive traffic to their site with the strategic help from Metric Theory. They ran campaigns through AdWords search, Google shopping, and Bing search. The ads focused on the value of an Isle stand up paddle board: inflatable, light, designed for performance, a free paddle, and free shipping. The strategy here was to drive qualified search traffic to specific product landing pages that featured products consistent with the ad. In this case, inflatable stand up paddle boards. 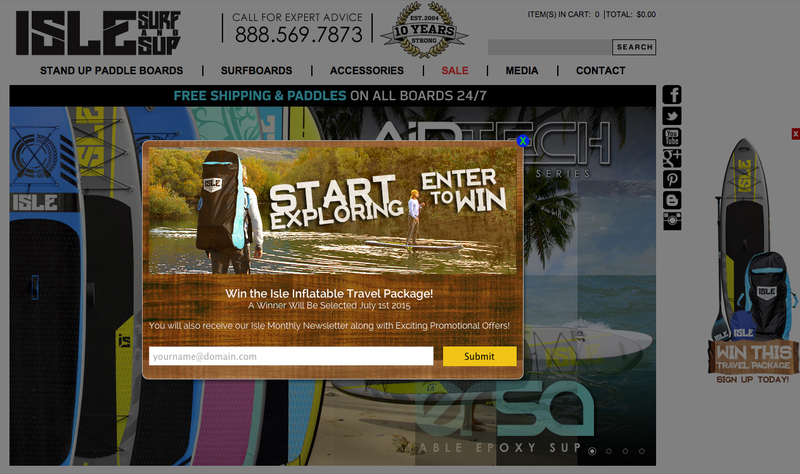 Isle implemented a contest promotion on the site with Justuno in which visitors could enter their email for a chance to win an inflatable stand up paddle board travel package. Using a custom graphics tab and email pop-up, they were able to engage and ask visitors to submit their information for a chance to win the travel package. This strategy effectively notified shoppers of the promotion and offered significant value to them as well. Because the contest item was a product of interest for their ideal customer, they were able to acquire quality leads who would be interested in purchasing their products. All newly acquired email leads were automatically fed into Isle Surfboard’s Constant Contact email campaigns allowing them to connect with their shoppers immediately. With Metric Theory’s help, Isle Surfboards experienced a 36% increase in traffic. The contest promotion through Justuno converted that traffic and increased email capture by a massive 660%. The increased traffic and email lead generation resulted in a 200% increase in Isle Surfboards online orders! Driving qualified visitors is a key component of a successful online store. But once that traffic is there, you need to convert it into leads and sales. By presenting the sweepstakes promotion to those qualified visitors, Isle Surfboards was able to add value to their store experience as well as grow their business. Interested in checking out some high-quality surf and SUP gear? Head on over to Isle Surfboards!